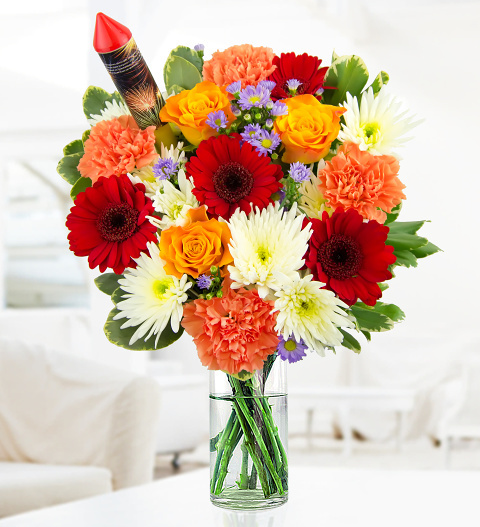 This fine bouquet of bright flowers is perfect for any occasion. We have chosen the finest Delianne Chrysanthemums, Marie Claire Roses, Carnations, Asters and Germinis for this fine bouquet. Inspired by bright fireworks with the warmth of a bonfire, this bouquet is sure to delight! We have even added a firework pick for added colour and flare! The Firework pick is a prop to the arrangement and not a real firework. Chocolates may contain nuts.